In the preview of the next episode featuring brothers Shahid Kapoor and Ishaan Khattar – we saw both of them spilling some beans. With each passing episode, Karan Johar's 'Koffee with Karan' has been throwing at us some really strong curveballs. From scintillating revelations and shocking confessions to scandalous gossips; the show has kept us entertained and how! 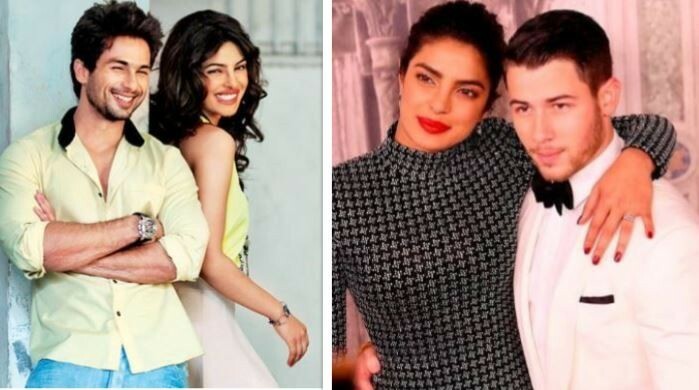 While Karan Johar has saved the best for the last – Priyanka Chopra and Kareena Kapoor Khan's rendezvous with him, Priyanka Chopra's ex – Shahid Kapoor – did have some juicy gossip for us. In the preview of the next episode featuring brothers Shahid Kapoor and Ishaan Khattar, we saw both Ishaan and Shahid spilling some beans. While Shahid mentioned that Janhvi Kapoor is not special since his brother is used to buzzing around a lot of people, Ishaan shocked us by saying he has been with women much older to him. And on being prodded, he even revealed that he has been with a woman aged 45. However, the most interesting part of the preview came when Shahid was asked by Karan Johar to give a piece of advice to Priyanka's husband, Nick Jonas. "Never back down, buddy. You are with the original desi girl," Shahid said. Woah! That's quite a statement. It was on Karan Johar's coffee couch where Priyanka Chopra and Shahid Kapoor had almost given away the fact that they were dating. The couple had come together during the shoot of 'Kaminey' and went strongly for a couple of months. However, owing to differences, they soon parted ways. Priyanka Chopra tied the knot with Nick Jonas in an elaborate and lavish ceremony at Umaid Bhavan Palace last December. The couple has been globetrotting and painting the town red ever since.